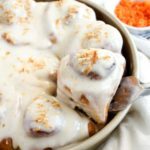 I am so excited to share this recipe with you today. It’s one of my favorite things to come out of my kitchen in quite a while – and I actually don’t say that all that often. Don’t get me wrong, I don’t post things I think are mediocre on here (and just to be clear, there are plenty of experiments that turn out mediocre in my kitchen, lest you think I’m some sort of superhero). But some recipes shine above the others. Some sort of flavor combination, or technique, or texture breakthrough may set them apart. This has all of those things!! And I’m not exaggerating when I say I wouldn’t mind having this as my birthday cake. In fact, Brian already requested it for his birthday this year, after we already consumed two whole cakes in two weeks. Seriously. Grapefruit seems quite a polarizing fruit, so I guess I won’t be offended if you say you don’t want to try it merely because you find grapefruit offensive. I may not understand you, but I’ll grant that plenty of people don’t like the unique flavor of grapefruit. The great thing is, you can use ANY citrus fruit in its place in equal measure of juice/zest, and it will turn out just as well. I’ve made this cake with lemon, and I bet it would be delicious with orange – maybe even lime, though if I’m going to put limes in a dessert you better believe it’ll be pie. 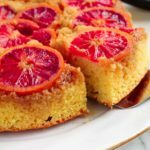 I encourage you to give grapefruit a shot in this cake, however. 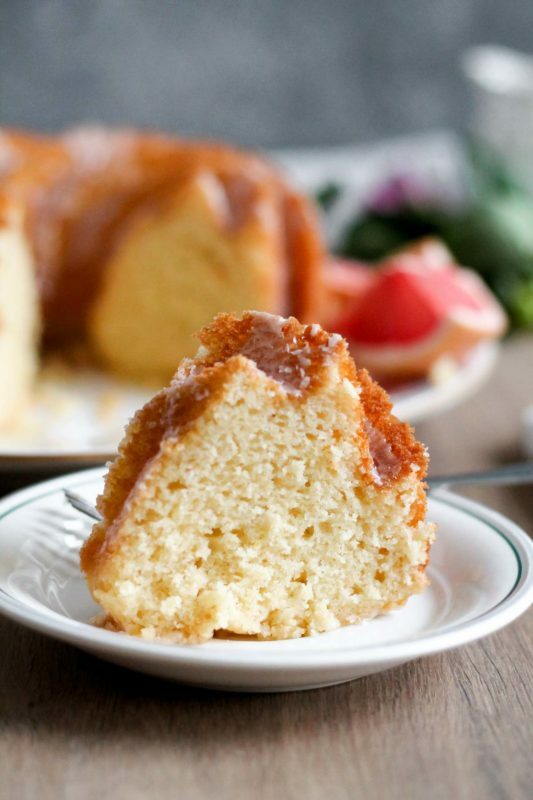 The light and airy crumb produced by the yogurt in the batter, combined with the sweet glaze we soak into the cake made from the juice of the fruit and just a teeny bit of sugar, produces an intensely bright and flavorful cake that contains none of the bitterness people sometimes associate with poor little grapefruit. The few kind people at work who recently inquired which recipe I’d be posting next all made the same screwed-up, you’ve-got-to-be-kidding-me-she’s-lost-her-mind face when I told them this cake was on the docket, and I guess I can’t blame them. Compared to cinnamon rolls or lemon meringue pie, this may seem a humble dessert, but let me tell you she is mighty. 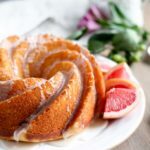 This grapefruit yogurt bundt cake is truly more than the sum of its parts, and I’ll show you why. 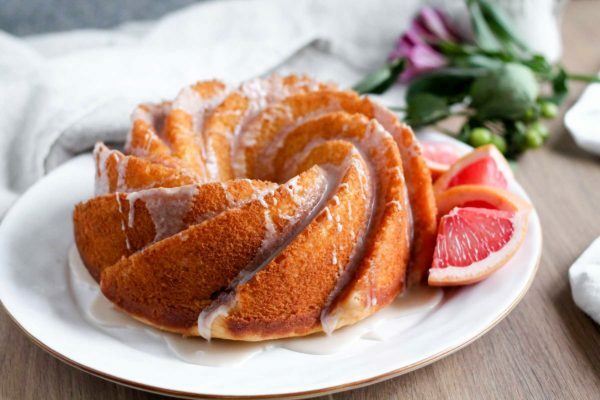 There are three elements to this cake, every one of them bursting with bright citrus flavor: the batter (which has zest + juice), the glaze (juice and 1 tbsp sugar), and the icing (glaze + confectioner’s sugar). I know you’re looking at me and saying that’s not necessary, but it’s really not a tremendous amount of sugar in the aggregate — and the three components together make an incredible cake. I encourage you to try it out. Rub the zest and sugar together before adding to the rest of the ingredients. You can just do this in a bowl with your fingers. This releases the oils in the zest and makes the sugar fragrant and much more citrusy – which leads to a more flavorful cake. Just rub it through your fingers until you smell that citrus scent, and you’re done (should take 30 seconds or less). 100% worth it. 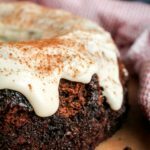 Grease your cake pan extremely well – especially if you have an intricately designed bundt cake like the heritage bundt pan I used in these pictures. Pretty, yes, but not if you have to spend half an hour trying to dislodge an unwilling cake in pieces from the pan. I use (a lot of) butter, but some people swear by Baker’s Joy spray, and others have said dusting the pan with granulated sugar after the butter or spray helps too. Whatever you do, make sure you really grease that pan. Turn it out after 10-15 minutes cooling time. Otherwise the sticky glaze will adhere it to the pan as it cools. I like to run a knife or spatula along the edge of the cake and the inner ring before flipping it onto a wire rack. If the cake doesn’t release immediately, bang on the top of the pan a few times with your fist, and that sometimes releases it. If that doesn’t work, just leave it sitting upside down for a while, and it should release on its own. If THAT doesn’t work, try running the spatula around the edges and down to the bottom more assertively, and try again. If all else fails – frosting fixes a lot of things. So, to sum up, there are three elements to this cake: the batter, the glaze, and the icing. Four, really, if you count technique with the bundt pan. My bundt pan is a 10 cup pan – any 10-15 cup bundt will do, just check the cake periodically after 35 minutes in the oven to see if it’s done. It shouldn’t take as long as most bundt cakes (usually they take 50-60 minutes) because there isn’t quite as much volume of batter. 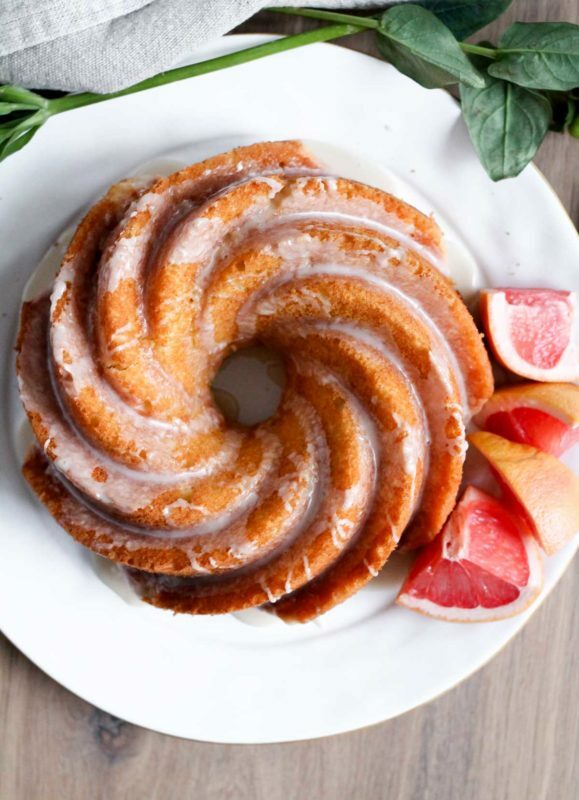 After all that, you may be thinking it’s no longer worth all the time and effort to make this grapefruit yogurt bundt cake, but let me assure you that it is. 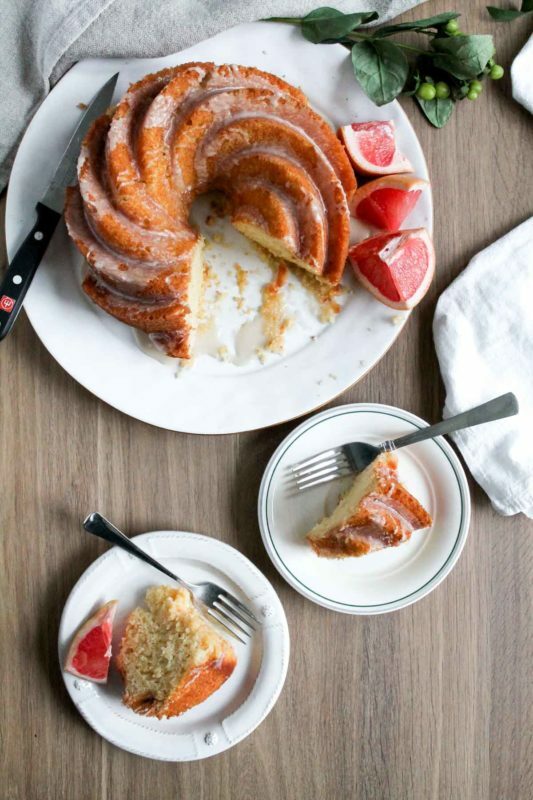 Here’s why: (a) you DON’T need a mixer to make this – just a bowl and whisk or fork will do; (b) the yogurt, olive oil, and citrus combine to make a light and airy cake with the most tender crumb, so you can feel good about having more than one slice; (c) this cake is a surefire way to brighten up a January brunch or dinner, when we all need as much help as we can get. Did I mention Brian and I ate two cakes in two weeks? Ok, I’ll leave it at that. 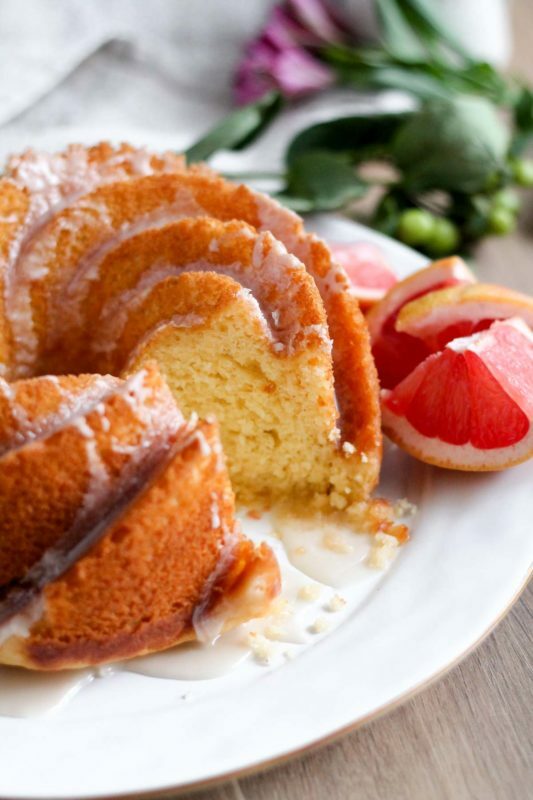 Grapefruit yogurt bundt cake: a light and tender crumb, subtly sweet, intensely flavorful cake. 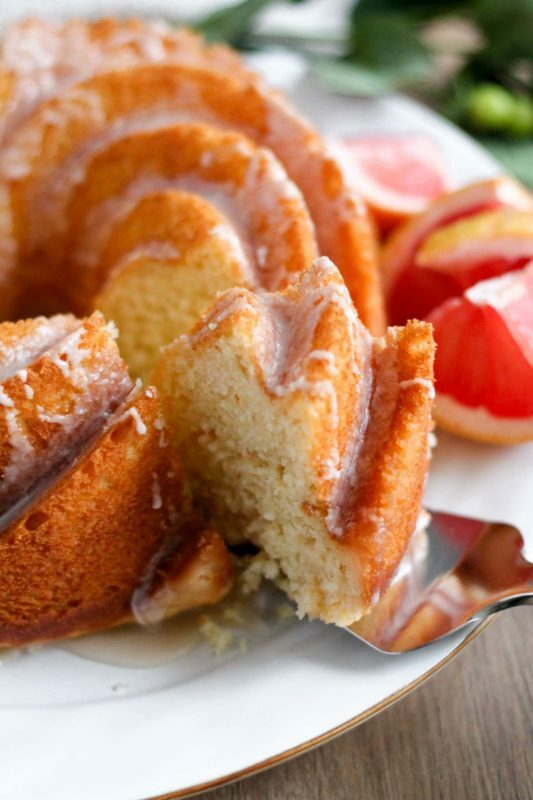 Don't skip the glaze on this one - it's where all the vibrant citrus flavor comes from. Preheat oven to 350 degrees F. Grease a 10-15 cup bundt pan EXTREMELY well. I use butter; you can also use cooking spray, and some people say sprinkling granulated sugar in afterwards also helps, but I haven't tried that. Set prepared pan aside. 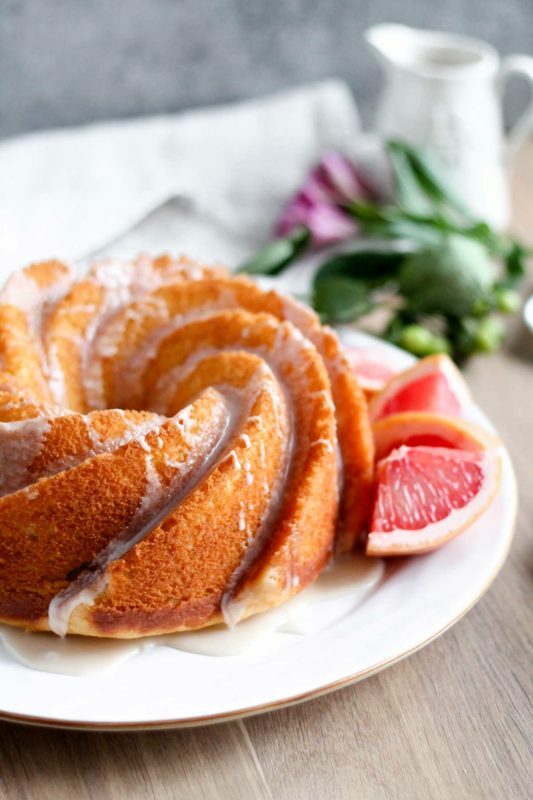 In a large bowl, rub the sugar and grapefruit zest together with your fingers until the mixture is fragrant; this releases the oils of the zest and makes your cake extra flavorful. Add the eggs, yogurt, olive oil, vanilla, and grapefruit juice to the sugar, and whisk it all together until well combined. Dump the flour mixture into the wet mixture, and stir it all together until smooth and combined -- but do not over-mix. We want a tender crumb, and over-mixing will make it tough! It's ok if there are still a few small lumps. Scrape the batter into the prepared bundt pan, smoothing out the top and rapping the pan on the counter a couple times to get rid of air bubbles. Bake for 35-40 minutes, until cake springs back when tapped and a tester inserted in the center comes out clean or with a couple crumbs attached. 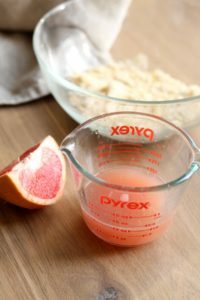 Glaze: Place 1/3 cup fresh grapefruit juice and 1 tbsp granulated sugar in a microwave-safe measuring cup or bowl. Microwave on high until bubbling and sugar has melted, about 1 minute. 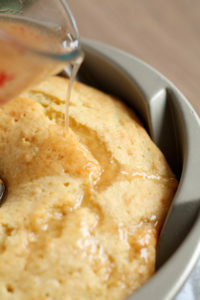 Whisk together and set aside to let cool; reserve 2 tbsp of the glaze for the icing. Icing: whisk together 2 tbsp of the prepared glaze, the powdered sugar, and salt in a small bowl until smooth and pourable. Set aside. 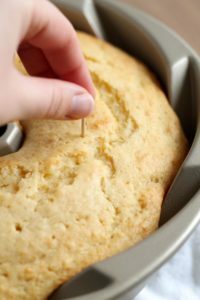 When the cake comes out of the oven, immediately poke holes all over the surface of the cake with a toothpick or fork. Slowly pour glaze over the hot cake to soak in. Don't pour too quickly or it will just run and pool down the sides, and that would be sad. 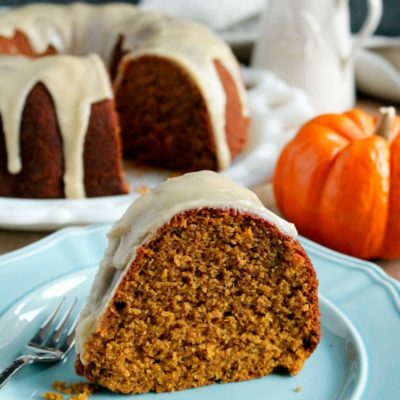 Let the glaze soak into the cake for 10-15 minutes, then run a spatula along the edges of the cake and the inner tube of the bundt pan to separate, and invert the cake onto a wire rack. If the cake doesn't immediately release, bang on the top of the bundt pan with your fist several times. If that doesn't work, just let it sit upside down on the rack and it should eventually fall out. Once the cake is released and cooled, pour the icing over top. Serve! This cake keeps perfectly, tightly covered with plastic at room temperature, for up to 5 days. I actually think it's best on the second day, once the flavors have a chance to sink in. Recipe adapted from Smitten Kitchen's grapefruit loaf cake. This cake looks amazing. Do you think that if I made it with Gluten free flour blend (the kind that is a cup for cup substitute) it will be as moist and light crumbed as with regular flour. I think it would make a lovely birthday cake for a friend who is not a chocolate cake fan – but she has a a gluten allergy – so I’m hoping this will work. Thanks for our advice. Hi Lee – I do think it would work with a cup for cup flour! They are designed to mimic all-purpose so it should work fine. Let me know how it turns out!